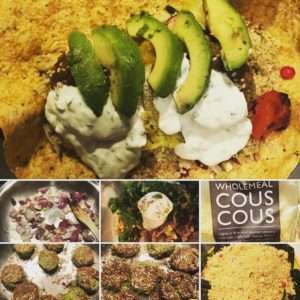 We had this mid week and falafel is not a difficult thing to make. Preparing all the accompaniments did take more time but you don’t have to do this all at the same time. Try making a big batch of hoummous at the start of the week and using it for packed lunches with crudités as well as adding to meals like this one. I never deep fat fry anything - it goes against all my knowledge and instincts to do so. So I am currently experimenting with some different oils which are better for us and trying to keep all oil use to an absolute minimum. Therefore while I begin cooking the falafel in the pan, I do finish off by baking them in the oven and drying off any excess fat using kitchen roll. As ever, I encourage you to play around with the ingredients here and adapt to your own tastes. This is only for guidance. Lots of recipes advise using your own dried chickpeas after soaking overnight and this is delicious too but cans are easier when we are busy, on the run and haven’t always planned dinner in advance. You will however, need to empty them into a sieve at least half an hour before you start to ensure they have lost some of their moisture. I also dab mine with some kitchen roll when I first tip them into the sieve. For the cous cous I used one whole packet Booths Organic cous cous. This is such a great meal when you are hungry since you simply need to place all ingredients into your food processor ( chick peas, tahini, the chopped onion, garlic cloves, parsley, salt, cumin, ground coriander, black pepper, cayenne pepper, paprika). Pulse quite carefully as you want all the mixture to combine but not too much! You are looking for it to look like quite a rough paste .... not like hoummous. Keep scraping the mixire down from the edges and make sure it is all evenly combined. Transfer to a bowl, cover with cling film and put in the fridge to sit for as long as you can - min 15 mins. Put your combination of oils in the pan and gently heat. You don’t want it to get to smoke point but you want it to be hot before placing your first falafel into it. Prepare a plate of gram flour (chickpea flour) and sesame seeds. 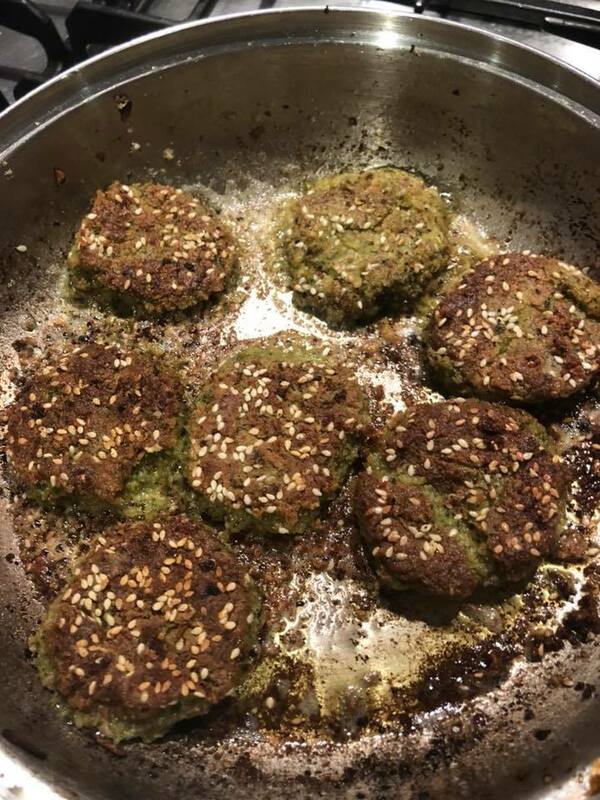 Using a small spoon, take a ball of the falafel and mould it into a small puck like shape ( if you make a fat ball, it won’t cook through as well). Place in your mix of flour and seeds and cover the falafel well before placing into the pan of oil. Continue with the rest of the mixture , taking time to also turn the falafel in the pan while you are adding new ones. They all brown beautifully and absorb the oil- which you will need to add to as you go through this process. When browned both sides, sit briefly on some kitchen roll to take out excess oil before transferring to a baking sheet or oven dish to finish off cooking in the oven for 10-15 minutes. Add the rest to the oven as they finish browning until you have the whole batch in the oven. Prepare your cous cous, accompaniments and serve in your own time. I saved some for packed lunches the next day too and had enough for snacks the rest of the week!